What is the newest hybrid of bridges? One of the newest, prettiest, and most economical bridges is the cable-stayed suspension bridge. With its sleek lines and thin roadways, it is the perfect bridge for most mid-span designs. The Tatara Bridge, in Onomichi, Japan, completed in 1999 is the longest cable-stayed bridge in the world, with a span of 890 meters (2,919 feet). Cable-stayed bridges suspend the roadbed by attaching multiple cables directly to the deck supporting the roadbed. These cables are then passed through a set of tall vertical towers and attached to abutments on the ground. Such engineering methods reduce the need for heavy, expensive steel and the massive anchorages that are needed to support suspension bridges. 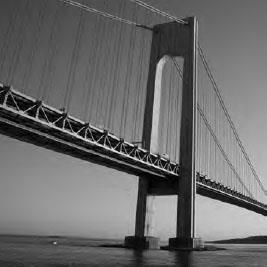 At 4,260 feet, the Verrazano Narrows Bridge in New York is the longest suspension bridge in the United States.